THE KILN LANE CEMETERY is a quiet country burial ground, run by the Parish Council and maintained for the maximum peace of the departed and their relatives. Prices with effect from April 1st 2018 for the reservation of an exclusive right of burial plot are: £600 for a single burial plot; £950 for a double (2 person) plot; and £200 for a cremation plot. The burial interment fee for deceased over 17 years of age is £450 and £300 for interment of ashes. All prices are double for those not living in the Parish. To arrange for memorial stones to mark the grave of loved ones according to a scale of fees available from the Parish Office. Please contact us on 01344 874268 or visit the Parish Council office in Broomhall Recreation Ground if you would like information on the regulations and fees. Holy Trinity CofE Church caters for a wide cross-section of people who may be looking for different things within their local church family. It offers a choice of Sunday services catering for different tastes and also runs many activities during the rest of the week for young people and children, life courses, small groups and seminars for adults. It reaches out into the community with a ‘Caring Cuisine’ programme for those who may be having a hard time. Sunningdale Baptist Church is an Evangelical faith community that aims to provide a place of worship, prayer, welcome, teaching and restoration to Sunningdale and surrounding villages. The church meets at The Hope Centre where it has been worshipping since 1828. Sunday worship is when its community joins together for praise, prayer and practical teaching from Scripture. With weekly house groups plus outreach meetings and programmes, backed-up by continuous prayer, we hope to bless all those around us and glorify our Lord Jesus. 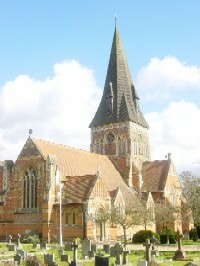 SACRED HEART CHURCH, London Rd, Sunningdale. Sacred Heart Church has served the Sunningdale Roman Catholic community for over fifty years. Built by and under the care of the Verona Fathers, it was originally a small chapel attached to a seminary where young men prepared for a missionary life in far-flung lands. The church was enlarged in the early 1960s and there are three Masses held each weekend. 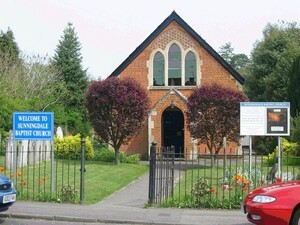 ROCK OF SALVATION COMMUNITY CHURCH is a Baptist Pentecostal vibrant, lively and welcoming community church based in Sunningdale in the Women’s Institute Building, where it holds a service every Sunday. More information about the church can be obtained by contacting the church direct.